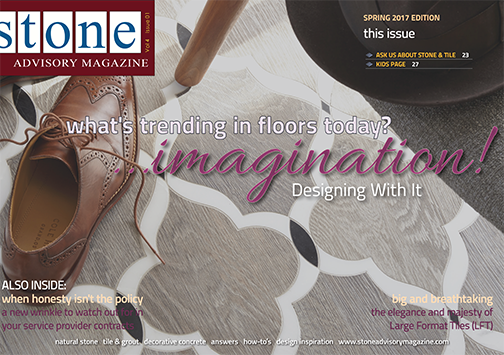 Inspiration and tips for selecting flooring, an impressive case study on the restoration of a 1900's Beaux Arts limestone staircase, the possibilities of Large Format Tile (LFT) and more. 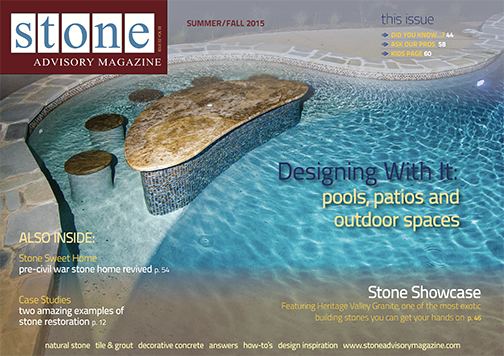 Learn about how to make porcelain tiles with this issue's Kids Page. Pools, pools, and more pools! Not to mention patios and other outdoor spaces. This issue's Designing With It is a real treat. And that's not all! Take a look at two amazing examples of stone restoration, as well as the full renovation of a pre-civil war home, and learn about Heritage Valley Granite -- one of the most exotic building stones around. Don't take this issue for granite. 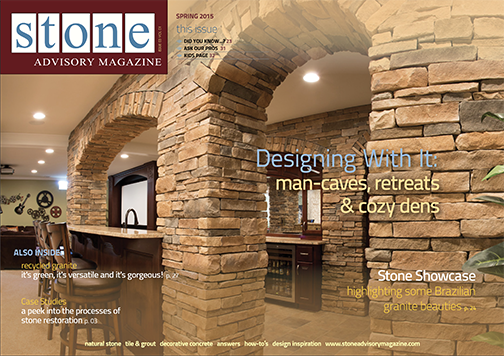 Not only do we showcase some spectacular and unique Brazilian granites and highlight the latest in recycled granite trends, but you won't believe some of the awesome man-caves, retreats and cozy dens in this issue's Designing With It feature. 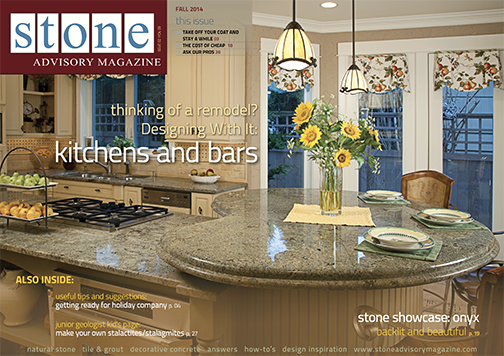 Thinking of remodeling the kitchen? This issue's Designing With it will truly inspire and delight, as well as suggest some ways to make the most of your space. You will find truly breathtaking onyx in the Stone Showcase, and kids of all ages can really sink their teeth into the Kids Page experiment -- making your own stalactites and stalagmites. 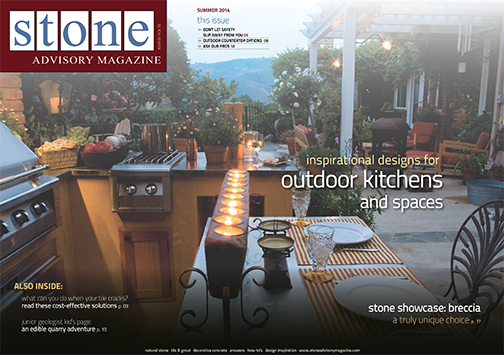 What to do if you have cracks in your tile or grout, important safety tips for summertime, rock cookie adventure for the kids page, and best of all, inspiring things to do with your outdoor spaces—from a simple fire pit to an elaborate outdoor entertainment area and many things in between.